We can't always predict accurately when a litter is due. Dogs' cycles are not always like clock work, so these dates are assuming that they will continue to cycle 6 months from their last cycle. Gestation is normally 9 weeks and we keep the pups here 8 weeks before we release them to their new homes. That makes a little over 4 months from conception to going home. We take 5 deposits only per litter before they're born since litters can vary so much in size. We think out pairings carefully. They're determined by complementing characteristics and the timing of the girls' cycles, amongst many other varying factors. Planned pairings are subject to change. See our Choosing Process in the FAQ to see how our adoption process works. Most times I can have a pup within 6 months for a family -- sometimes much sooner, and sometimes a while longer. If you want to be on the wait list, please read through my website and submit your application. I have 25+ people on my waitlist for all sizes and timeline requests. The number of pups born in each litter will determine how much room I have for more deposits. I'll only accept more deposits if you're willing to wait while previous deposits are filled. The current average of pups in a litter is 7-8. I don't like to take more than 5 deposits per litter until the pups are born, and when there are more than 5 pups I'll accept more deposits. Future Pairings are not written in stone and will depend on demand/suitable mating partners. The girls are doing their own thing when it comes to their cycles. I can only guess what will happen next! Here is the latest! JJ and Abe for F1B medium goldendoodles. Due first part of April and pups go home in June. Penny and Marlo for F1B mini goldendoodles. Due later in April and pups go home later in June. These wait lists are full until the pups are born when I'll see if I can take more. Tess and Yogi or Swede for F1 standard/medium goldendoodles. Darla and Yogi for F1 standard goldendoodles. 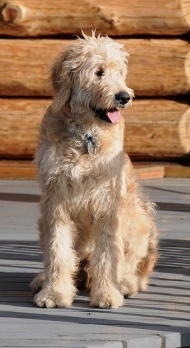 Chevy and Yogi or Horton for F1 medium/standard goldendoodles. Biscuit and Yogi for F1B standard goldendoodles. Zola and Marlo for F1B mini goldendoodles. As much as we like to be in control and know when the dogs will cycle and conceive, we remain at the mercy of nature taking it's course in God's time. I only breed a female once a year, and when it is her turn we breed her. They usually cycle every 6 months but this varies from 4-10 months. There are also occasions such as "false seasons, false pregnancies, split cycles, low sperm counts etc..." that add challenges to our plans. Many times several girls will season/cycle at once, so we can have multiple litters at a time. In saying this, I hope to increase your understanding and help you to realize that this is not a retail store, where we can order the exact item for the exact timing you need. It is often best to realize that your patience will pay off... we normally can have a pup ready for you within 6-8 months, but usually sooner depending on supply and demand. Answer: We artificially inseminate. Although there is a lower success rate we get a variety of sizes, which on occasion gives us pups as small as the sire or as big as the damn. Normally the range is 20-40 lbs for a mini poodle crossed with a standard size golden retriever. Not all girls conceive easily and those ones I tend to leave with the bigger males for natural copulation.